As a school that loves to read, the library plays an important role in the daily lives of all KAA students. Based at the heart of the school, our three libraries allow us to have a designated study area for each Key Stage, providing specialised resources for every stage of your child’s education. Reading for pleasure is an important focus of the library. We stock a wide range of materials to appeal to the different tastes of our students, including magazines, newspapers, fiction, graphic novels, biographies and non-fiction. 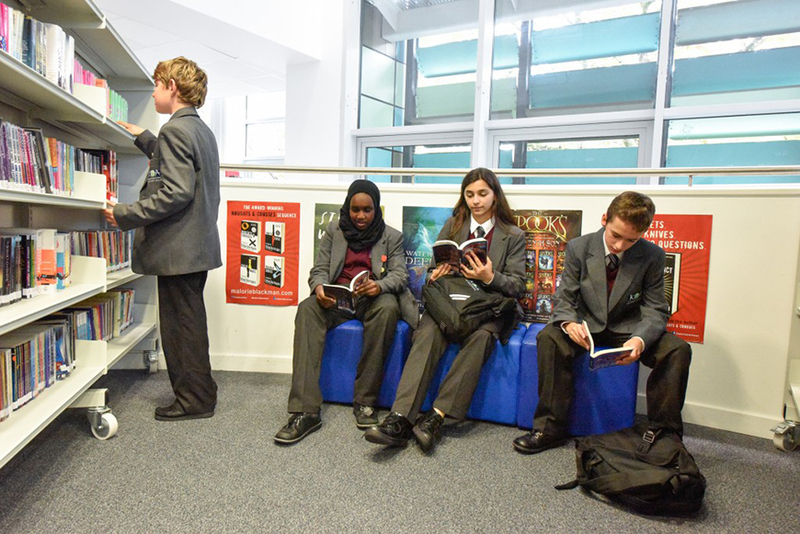 As part of their Morning Reading sessions, students regularly visit the library to browse the resources on offer and engage in individual reading. Students can borrow up to 6 books at a time, which allows them to borrow resources for their studies in addition to a reading book. Students are expected to carry a reading book in their bag at all times. We regularly purchase new stock for the library, and students can request new titles by speaking to Miss King if the book they are looking for is not in the catalogue. In addition to providing leisure reading for students, the library is a study and learning space. The library offers a Homework Club after school Monday to Thursday during Enrichment. The library stocks a wide range of non-fiction reference books and revision guides to support homework and revision. Students also have access to chromebooks in the library which enables them to access KAA Online and complete their homework. Student librarians attend a weekly duty in the library during which they learn how to shelve, catalogue and loan books to other students, as well as assisting with the technology used in the library space. They are selected by the librarians for their enthusiasm and regular use of the library. By learning these skills they work towards the School Library Association Student Librarian certificates and earn House Points.